I’ve written two posts recently about finding work/life/run balance a challenge this year. I started 2017 off with a run streak that felt great, but then Christmas vacation ended and I slammed back into reality. 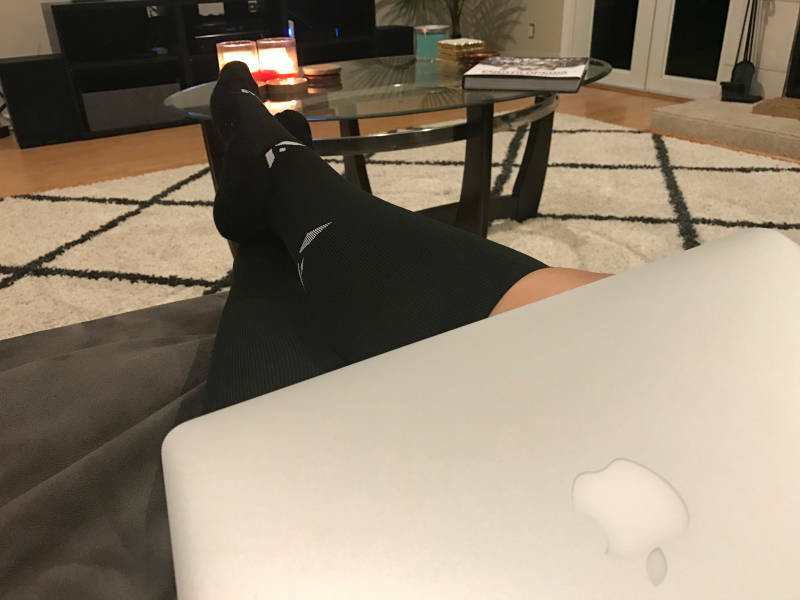 It sounds like a lot of you are also juggling many balls, so I thought I would share a few things I do every night to relax. These are simple things, but they really help me calm down physically and mentally at the end of the day. 1. Light a couple of candles. 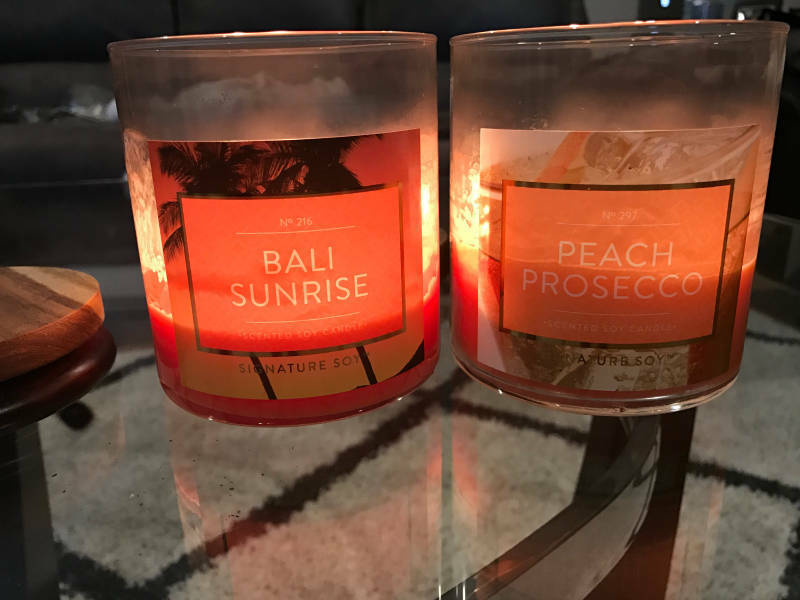 These soy candles are just $10 at Target they last about a month for me. I burn them for about 2 hours every night, and sometimes longer on the weekend. 2. Use a good smelling lotion. Since I run in the evenings I always take a shower in the evenings. This shower usually signals my transition from being on-the-go to settling in for the night. 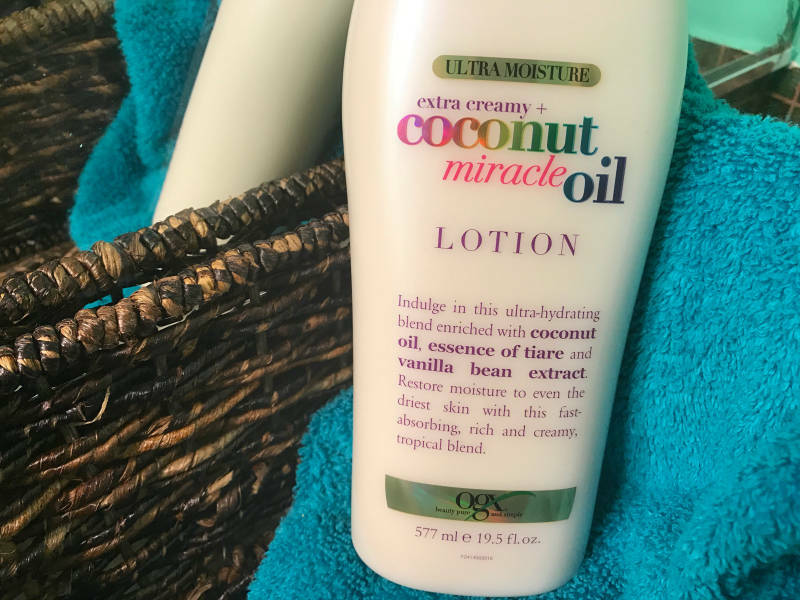 Since I’m all about scents, I put on my favorite smelling lotion after the shower. Not only does this make my skin soft but the scent really relaxes me. Who knows, maybe it only relaxes me because I associate it with winding down for the night, but it works! 3. Chill on the couch with the lights on. This one is a no brainer, but I like to chill out on the couch. I like to leave the lights on and I also make sure I’m sitting upright so that I don’t fall asleep. As soon as I turn the lights out or lay my head down I will start nodding off. Since I want to spend time with Adam while watching TV or mindlessly browsing the Internet I need to stay awake! 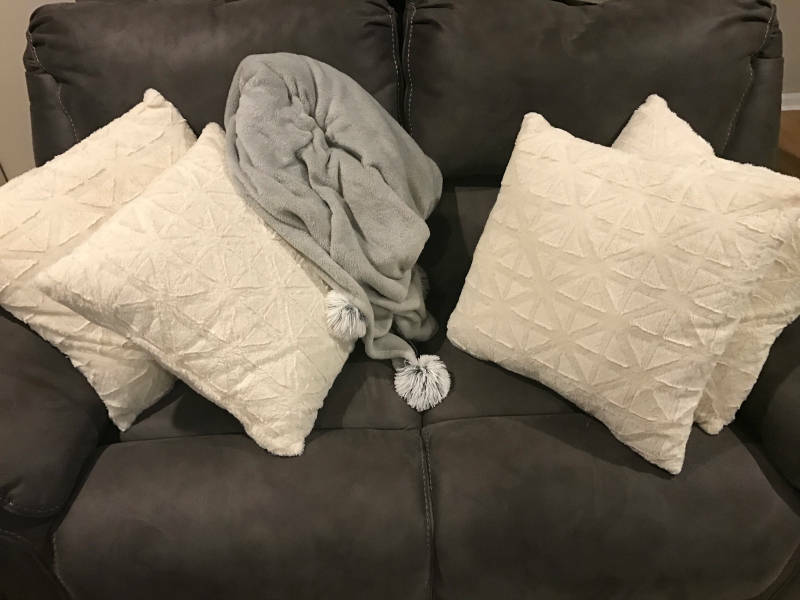 I move all of the pillows off of the big couch onto the love seat so I won’t be tempted to lay on them. 4. Read an old book in bed. When I head up to bed at night I’m really going there to read. I’ve been reading for at least 30 minutes a night before falling asleep for years. I know there are plenty of studies that say that reading before bed is bad for you, but it’s part of my routine and it helps me relax. I usually read books I’ve finished before so that my brain isn’t working too hard. I just scan over the pages enjoying an old adventure (like Harry Potter) before my eyes close for the night. 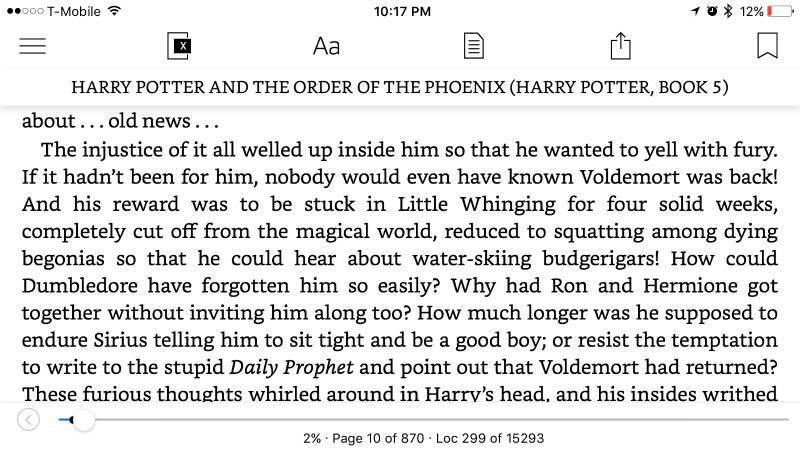 I’m currently re-reading Harry Potter and the Order of the Pheonix. This has traditionally been my second least favorite HP book (right behind Chamber of Secrets), but I’m really enjoying it this time. Do you have any nighttime rituals? Previous Post New Vlog: I Love Days Like This! Next Post Running Scavenger Hunt! You have relaxation down to a science! When I run during week, I go right to work, so no relaxing for me. But on the weekend, I like to watch TV, fiddle on my computer, or puzzle! Oh, and stretch/shower of course! Yes! I’ve started stretching in the shower a bit. I don’t know if the warmth/humidity makes it good or bad to stretch but it feels good! Oh I don’t stretch IN the shower! CoS is probably my least favorite in the series too, but seriously there needs to be more love for book 5. I know Harry is a whiny prat for most of the book and I could do without Grawp, but there are so many other good things! Luna Lovegood! The DA! Dobby! Weasleys’ Wizard Wheezes (and the scene where the twins drop out)! It definitely ranks above Goblet of Fire (for me at least). Okay yes! The scene where the twins drop out is ICONIC and the DA is awesome. Those are definitely highlights for me, but GoF is my faaaaaaaaaaaaaaaavorite of all the potter books. I want to reread HP! I loved all of the books so much when they came out! I reread them in the summer of 2008, but I feel like I have forgotten a lot, so I need to do another reread soon. 🙂 I don’t really have a nighttime routine–I should probably get into one, because I’m kind of all over the place at night! I try and re-read them once a year (lol), but the last couple of years I’ve skipped 1-3 since I’ve just read them so.many.times. now! I definitely have the problem of falling asleep on the couch! Rich has started to call me “Sleepy Sam” because one minute I’m talking to him and the next minute I’m completely out. I’m usually finished my runs around 7ish so I like to eat a snack, take a shower and then cook dinner. I’ve been trying to go to bed earlier so I’m winding down and getting ready for bed after that. I love the idea of lighting a candle. I love the smells! I laughed when I read the covering up the smell of sprouts. Have you tried “shredding them” (chopping them up finely) instead of just cooking them whole or cutting them in half? It takes so much less time so I feel like the smell is less overbearing.